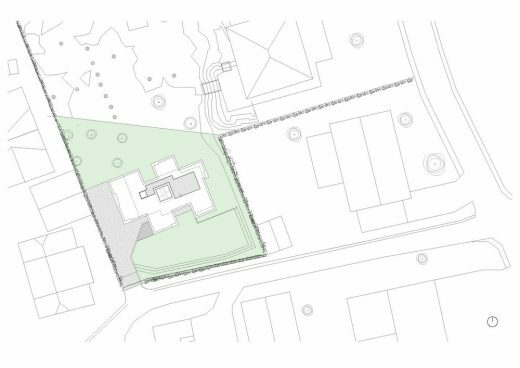 The starting point for this task was a typical challenge in Oslo: densification in an area of existing single family houses. 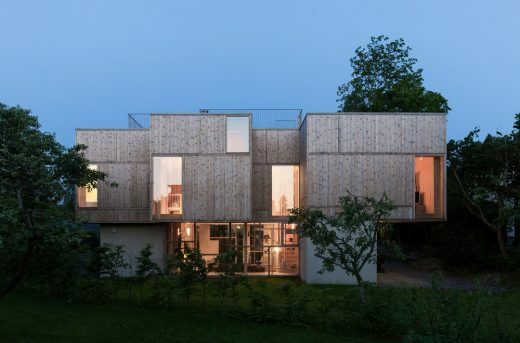 The house is broken up into smaller volumes to adapt to the relatively tight situation and the scale of the surrounding buildings. 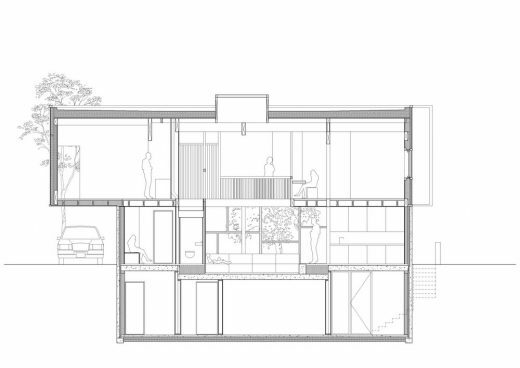 Prioritizing the enjoyment of the garden, and the interior openness of the spaces. 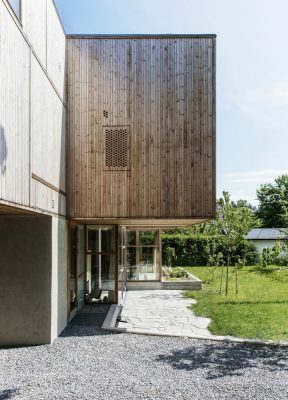 The project is organized around a main double height living room, that connects the whole house visually. 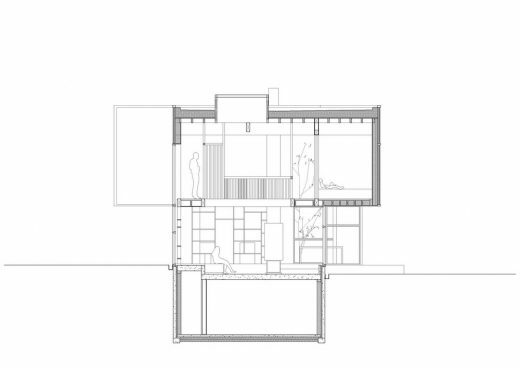 This room acts as a the core of the house, distributing all functions in a very connected unitarian space. The room is surrounded in first floor by lobby, kitchen and dining room, and the garden with its various outdoor areas. A staircase leads up to a gallery with access to the private rooms, bedrooms and bathrooms. The gallery is a casual place, and acts as an extension of the rooms. A large skylight provides varied light and shadow effects through the day. The plot was a lovely old garden, but a flat terrain and a relatively tight situation gave a limited view. It was important for us to preserve much of the garden for outdoor use, but also as a natural quality to the enjoyment of residents, both outside and inside. Therefore, the ground floor has a relatively limited footprint, while the larger upper floor cantilevers out creating covered outdoor areas. 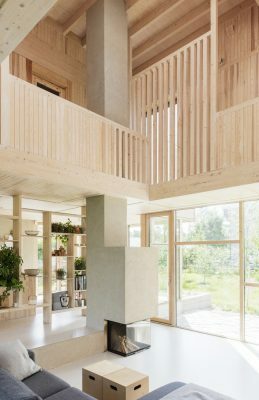 As an addition to the garden, and as compensation for the reduced view, the project creates an inner landscape, a sequence of rooms with varying scale and use, different degrees of transparency and privacy, changing views and light conditions. 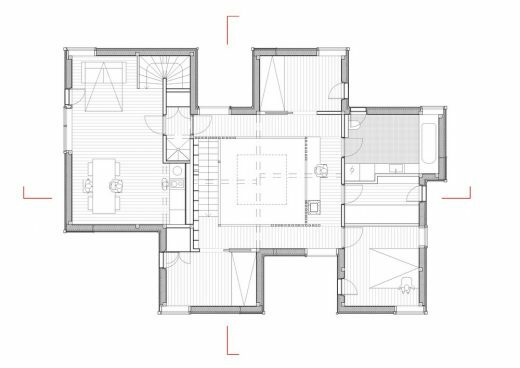 The central double height living room is the heart of the house and connects all the rooms and areas. A system that cannot immediately be read as a clear structure, but rather gives the qualities of a forest, where you can let your eyes wander along continuing branches. 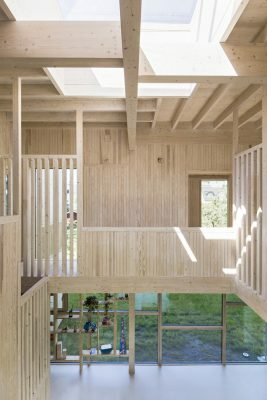 The house structure is prefabricated wooden columns and beams. 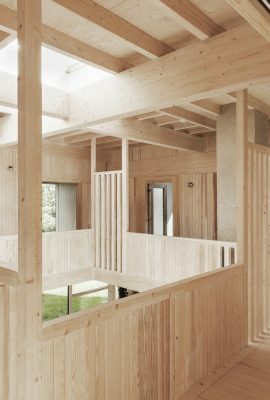 All structure parts are exposed in the interior of the project. The cantilevered rooms on the 2nd floor hang from the roof beams. The beams have different dimensions, depending on the cantilever length. The columns have unique dimensions, adapted to their individual loads. 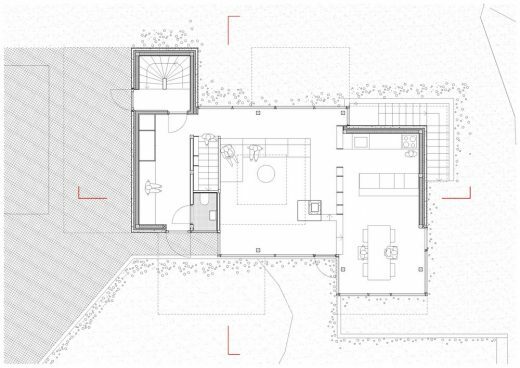 It has not been the goal to standardize or clean up the construction, but rather let it be an organic result of the housing geometry. The project is carried out within a limited budget. An open and trusting cooperation between the builder, architect and contractor has nevertheless enabled a distinctive and elaborate house.